Want to play West African guitar? The above one is a good fingerstyle example to check out. The interesting and most apparent thing about it is the pentatonic melody line. Why? Because it’s playing in the lower register, which means it’s pretty much the bass line of the piece. If you follow the harmony built upon that bass/melody line, those additional notes form the I., iii. and vi. degree chords of the major scale. 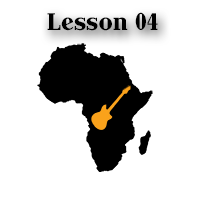 Of course by nature and by origin, most African music is modal; the music of the West is no exception either. But as with all modal music, certain parts create certain tonality, so the ears (and the mind) can have some familiarity to grasp onto. Notice that technically I’m fretting fairly usual major and minor chord shapes (with extensions; some of them are so called “jazz chords”). However, the secret to this kind of music lies in the rhythm. That shouldn’t hit you as a surprise, the dark continent is famous for its rhythmical richness. In this particular example, the rhythm comes in the form of arpeggios. That puts the jazzy chord grips into a different context. The lesson is expressed in a compound duple time signature. Note the irregular phrase lengths that give a certain, exotic mood to the tune. The fretting fingers execute a couple hammer-ons and slides. These are important to get clean and strong, so the main melody comes through. 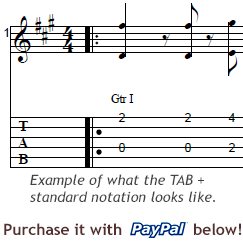 They are indicated clearly in the tablature, so I suggest you to get it below. Make sure that you get the string skips accurately with the thumb. The accompanying harmony notes need to ring through nice and clean as well.